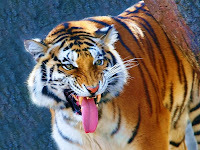 "Wild tigers are at the very top of the food chain." 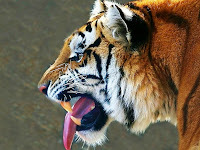 "The tiger has only one predator...MAN!" 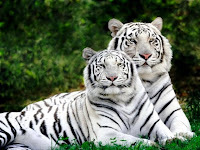 There were originally eight subspecies of tiger; Bengal, Indochinese, Caspian, Bali, Sumatran, Javan, Siberian, and South China tiger. 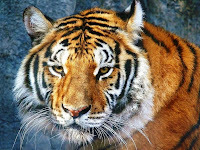 Three of the eight subspecies are now extinct. 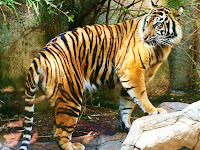 Bali tiger met its demise in 1940's, Caspian in 1970's and Javan in 1980's. 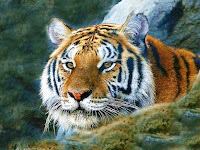 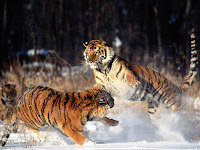 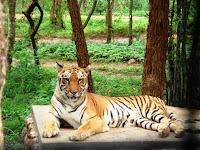 The Bengal tiger is found in India and around the Nepal/China border, it is the second largest of the Tiger subspecies.